The storm’s path will cross parts of Japan and test an already stretched energy sector. Japan has been preparing for Typhoon Neoguri since last weekend, and on Tuesday it began battering Japan’s southernmost Ryukyu Islands, which include Okinawa and its 1.2 million people. The typhoon will be one of the biggest many parts of southern and western Japan have seen in decades, with Commander James Hecker U.S. Air Force’s 18th wing in Kadena saying Neoguri will be the biggest typhoon Okinawa has seen in 15 years. As Okinawa and Kyushu prepare to take the brunt of what was until Monday categorized as a “super typhoon,” local infrastructure will be pushed to its limits, especially in Kyushu, where the area is saturated from heavy rains last week. Japan’s Meteorological Agency has issued an alert for Okinawa’s main island, and local officials have advised 480,000 people to evacuate to local municipal buildings. Waves are expected to reach as high as 14 meters, with sustained winds of 198 km (123 miles) per hour and gusts up to 270 kph (168 mph), the equivalent of a Category 3 hurricane in the North Atlantic Ocean. Neoguri is forecast to drop 80 millimeters of rain an hour in Okinawa, according to the meteorological agency. The Typhoon is expected to reach Japan’s westernmost main island of Kyushu by midday on Wednesday, with sustained winds still at around 200 kph. 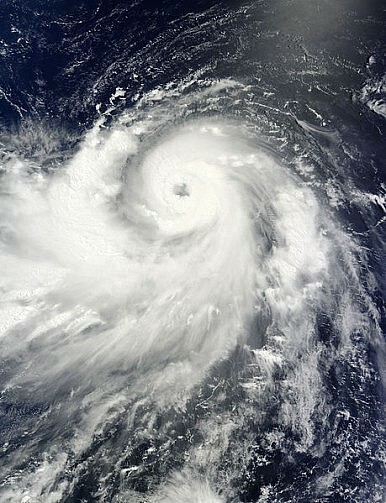 The sheer size (if not strength) of Neoguri’s storm front is being compared with Hurricane Sandy, which devastated the U.S. east coast in 2012. The projected path of the typhoon is expected to cross Nagasaki on Kyushu’s east coast, which saw 20 centimeters of rain on Thursday (a 50 year record), while parts of Kyushu saw 25 centimeters of rain on Friday. The heavy rains have continued on Monday, and this high level of saturation puts large population centers on the island, like Nagasaki, at risk of floods, landslides, and possible power outages. The storm is expected to track eastward along the main island of Honshu, as it weakens before reaching Tokyo Thursday afternoon. Kyushu Electric Power Co. and Kansai Electric Power Co. are western Japan’s two largest energy providers, and both are struggling to meet the government’s 3 percent surplus threshold again this year as peak summer usage begins, with all of their nuclear reactors currently offline. As the storms high winds drive large waves and ocean surges along the coasts, nuclear reactors on Kyushu and Shikoku in the path of the typhoon will be closely watched to see how they fare. With energy companies already stretched to the limit, loss of power in certain parts of western Japan is also likely, further threatening citizens already at risk of floods and landslides. Will Japan’s Volcanic Eruption Further Delay Nuclear Restart? Japan’s seismic unpredictability is once again sparking domestic fears.